In areas where public entertainment takes place, in most cases there is a requirement for an annual test & inspection of that area involving the entertainment electricity supply and area emergency lighting (sometimes, the entire electrical wiring system). This is usually a requirement of the Licensing Department of the Local Authority, they specify that the inspecting contractor must be approved by the NICEIC or ECA and must comply with the regulations of the IEE. The defintion of a public event requiring entertainment licence testing is any kind of entertainment into which a passer-by or member of the public can be admitted by payment or otherwise. 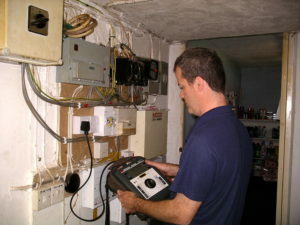 Our fully qualified electricians carry out all necessary testing and provide all certification required by local government to enable the duty holder to satisfy these requirements. The Health and Safety Executive has provided an online booklet entitled “Electrical Safety for Entertainers indg247” in Acrobat form (you can download indg247 and Acrobat Reader from our Downloads page) detailing ways you can make your PA and electronic equipment safer for the public, what laws you need to heed. Therefore, we can help you to ensure your event goes smoothly, safely and legally.